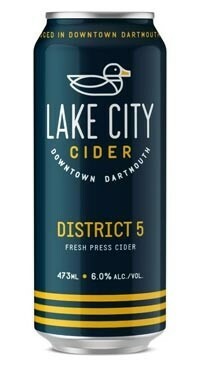 Dartmouth is the foundation upon which Lake City Cider is built. They’re proud Darksiders – they’ve grown here, played here, lived here and loved here and they wouldn’t have it any other way. They’ve seen how Dartmouth has changed and they’ve changed with it. And they’re honoured to make quality local cider right on Portland Street with as much character and joy as the city we love. A crisp and clean cider fashioned from a special selection of freshly-pressed Nova Scotian apples, District 5 boasts a taste as familiar and vibrant as the area it’s named after. Evoking memories of the lapping waves of Lake Banook and feathered friends at Sullivan’s Pond, this cider is crafted to be as true and steady as the people who make up the heart and soul of Dartmouth.